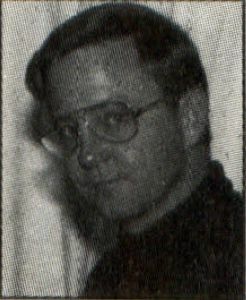 Gregg Anderson a captain in the USAF with a background in electionics repair, has been an avid Atari user since 1982. Gregg's roommate, a cat, often leaves messages on DELPHI under his username. "One of these days," Gregg insists, "I'll catch him at it." Over the past two years, a number of really outstanding printers have been released onto an otherwise unsuspecting population. To help that population cope with this flood (and have some fun in the process), I thought I'd do a one-on-one comparison of some of the better (and generally more expensive) printers currently available for ST owners. Since there are so many different types of printers out today, I've had to limit myself to one or two of each basic type Sorry, no daisy wheels this time around. In the first ring of this circus is the traditional 9-pin dot-matrix printer, represented by Panasonic's 1092i. The Epson LQ850 will be representing the new, high-speed breed of 24-pin printers. Since laser and inkjet printers are currently all the rage, Rings 2 and 3 are occupied by a couple of them. These include the Hewlett-Packard LaserJet II, the Blaser-Star II, Atari's own SLM804 and the recently released Hewlett-Packard DeskJet. I chose standard-width printers since (due to their lower costs) these are by far the most popular with most "home buyers." As a rule, wide carriage printers are mainly business machines, though a few have found their way into some home systems. All printers will be compared on the basis of print speed, print quality and overall cost of printing, both with and without the cost of the printer being included. I'm not including any finance or depreciation costs in this. The cost factors are simply the price of the ribbon/toner/drum divided by the number of double-spaced, letter-quality pages said consumable is rated to produce. For "price per lifetime" the figure is based on the price per page over the estimated life of the printer, added together with the price of the printer itself. Be warned that all prices listed here are full retail and rounded up to the nearest dollar. Most printers and their consumables (ribbons, toner, drums, etc) are readily available at discounts if you're willing to shop around a bit. I'll try and present the advantages and disadvantages of each printer and offer a few thoughts and suggestions on them from time to time. The programs used for this test were chosen to provide the full spectrum of common computer uses. For text I picked 1st Word and Word Writer ST. For graphics it was PrintMaster + and DEGAS Elite. Desktop publishing users will find Soft-Logic's Publishing Partner among the test programs, and for those of us interested in GDOS applications, I included Supercharged Easy Draw and the WordUp word processor. Please remember that this is a test of printers and not of programs. Don't compare times between the programs since (other than 1st Word and Word Writer ST) all of them are based on different print files and none handle their output in the same fashion. The newest 9-pin from Panasonic is the 1092i, a noticeable upgrade in both speed and quality over the original 1092 with a very affordable price. Offering both Epson and IBM compatibility, this unit is able to handle almost every software package available for the ST. One of the other advantages the Panasonic offers is that its ribbons use a reinkable sponge wheel to save on printing costs. As expected, the 1092i is one of the slowest printers tested here and uses a dual-pass print for its letter-quality (LQ) mode. While some of its graphics print times are shorter than the DeskJet's or the H-P's, we have to keep in mind that the 1092's overall resolution is less than half these printers. Print time is generally determined by resolution; that is, the higher the resolution, the greater the amount of data that must be transmitted from computer to paper and, thus, the more time it will take. Though its print quality can't match the laser's or DeskJet's, the 1092i still does an acceptable job in both text and graphics. I was impressed by the solid black printout this unit provides, much darker than the Epson LQ850's print. The most surprising aspect of the 1092i is that it does as well as it does, considering its cost is only a fraction of the competition's. The 1092i is rated by Panasonic at 288 cps in draft and 57 cps in LQ mode (Pica12 cpi) and offers two draft and two LQ fonts in 10, 12 and 15 cpi. At 6K, the internal buffer is capable of holding a limited number of downloaded fonts. No font cartridge slots are available. The Panasonic 1092i retails for $500. Typical of the new breed of 24-pin printers is Epson's new LQ850. The 850 combines an excellent LQ mode and high print speed with a paper handling system that's in a class by itself. As the LQ850 shares its command set with the earlier LQ1500 system, rather than the LQ2500, it should be supported by most current ST software. For serious graphics users there are GDOS drivers available, and the unit does respond to standard Epson 9-pin ASCII commands for fast, outstanding (single pass) LQ text prints. I have to admit to being somewhat disappointed by the LQ850's graphics output though. Even with a new ribbon it seemed washed out and gray rather than the expected solid black. The unit also had a tendency to give rather jagged vertical lines, and I suspect my test unit may have been in need of some alignment. The LQ850 is rated by Epson at 264 cps in draft and 88 cps in LQ mode (at 12 cpi). It offers one draft and two LQ fonts in 10 cpi, 12 cpi and condensed prints. At 6K, the expandable internal buffer should hold at least some downloaded fonts, and there are two cartridge slots available for extra fonts and support boards. The Atari SIJH804 Atari's SLM804 is unusual In that it has no memory or CPU of its own. Instead it relies entirely on the CPU and RAM of the host computer. The Atari SLM804 retails for $2,000. The Hewlett-Packard LaserJet II This very solid printer has sold moreunits than any other laser on the market today and has become the standard by which all others are measured. The Hewlett-Packard LaserJet II retails for $2,695. The Panasonic 10921 The newest 9-pin from Panasonic is the 1092i, a noticeable upgrade in both speed and quality over the original 1092 with a very affordable price. The Panasonic 10921 retails for S500. The Epson LQ850 The 850 combines an excellent LQ mode and high print speed with a paper handling system that's in a class by itself. The Epson LQ85O retails for $850. The Epson LQ850 retails for $850. 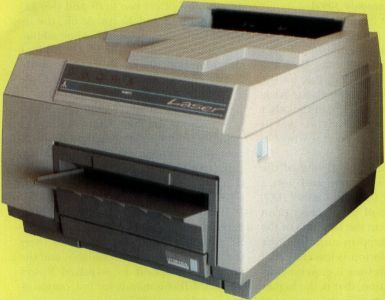 The current standard of laser technology has to be the LaserJet II from Hewlett-Packard. This very solid printer has sold more units than any other laser on the market today and has becpme the standard by which all others are measured. Like most lasers, the H-P offers fantastic quality, near silent operation and a text speed sure to please even the most jaded printer freak. There are some problems though. For one thing the H-P offers no emulations for other printers and thus requires that your software be capable of working with its own PCL command set. Other than GDOS-based software there are few programs out for the ST right now capable of doing that. A second problem is that, as a rule, lasers tend to be much more expensive to buy and operate than dot-matrix printers, often by a factor of five or more. Something else to consider is that when operating in GDOS you'll require a minimum of one megabyte of computer RAM to hold your various GDOS fonts, with 2.5 megabytes or better being preferred. Adding insult to injury, the printer itself will require at least a full megabyte of internal RAM to handle anything other than simple text. Need I mention that the H-P comes with only 512K of internal RAM? A final headache is that most lasers, though fast with text and very fast when printing out multiple copies of a single document, can easily take what seems forever to print out that first 300-dpi page of graphics or GDOS text. This is because the computer must transmit the entire document over the parallel port to the printer before any printing can begin. When you're talking about a megabyte of data, you're talking some time. Of course, once finished the quality is unmatchable, but you'll have to have some patience. Built into the unit are six fonts in various styles with both standard and landscape (sideway print). If you're not satisfied with the built-in fonts, there are two font cartridge slots and an almost unlimited number of downloadable "soft fonts" available for the H-P. The LaserJet II is rated by H-P at eight pages per minute,.but this doesn't include transmission times and is for copies of the document already in RAM. The Hewlett-Packard LaserJet II retails for $2,695. A newcomer to the printer market is Biaser Industries’ new BlaserStar II. This unit offers Hewlett-Packard, Diablo and Epson FX compatibility and comes with a full megabyte of memory. Blaser also uses a data compression system that makes the standard one-megabyte work more like 15 megabytes, giving enough memory for a lot of downloaded fonts or a full 8x14-inch graphics printout. Recently, Blaser Industries also released a lower priced half-megabyte version of this unit for folks interested more in text than graphics. With its built-in Epson/Diablo compatibility, the BlaserStar doesn't suffer from the lack of ST software support that the HP (or the SLM804) does. In fact, it should operate with almost all the software currently out for the ST. The BlaserStar II operates at about the same speed as the HP but retails for around $100 less and comes standard with twice the built-in RAM. One pleasant surprise is that, on a cost-per page basis, the BlaserStar II costs less than half what the H-P does to operate. Of course, the BlaserStar suffers from most of the same flaws as all the H-P-compatible lasers do when it comes to graphics print speed, but if you can live with that then this unit seems to be the one to beat among the HP clones. I did run into an oddity with the BlaserStar II. This unit requires that it be the last item turned on when powering up your system. Turn it on before the computer, and the ST can't access it in any way. Like the LaserJet, the BlaserStar II is a modern, compact design that impresses you with its solid construction and near silent operation. All in all, it's a most impressive unit that not only satisfies the need for emulation but is even slightly faster than the H-P when printing. The BlaserStar II comes with three fonts, with both italic and bold styles, and offers standard and landscape printouts. Unlike the H-P there is only one cartridge slot available, though the unit will accept downloaded H-P soft fonts. 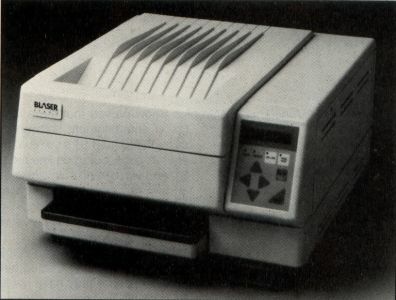 Like the H-P LaserJet II, the BlaserStar II is rated at eight pages per minute under the same circumstances. The Blaser Industries BlaserStar II retails for $2,595. Atari's SLM804 is unusual in that it has no memory or CPU of its own. Instead it relies entirely on the CPU and RAM of the host computer (thereby limiting its use to a Mega system or an Atari ST of two megabytes or more). It's also unusual in that it uses the DMA port of the ST rather than the more standard parallel or serial ports. The result of this is that the SLM804/ST/GDOS combination is likely the fastest low-cost laser desktop publishing system on the market today. Graphic printouts of 300 dpi in less than one minute are the rule rather than the exception (an H-P or clone could take up to seven minutes or more to print the same page). There are some prices to be paid for this speed though. One is compatibility. The SLM804 has had to make do with a less than perfect Diablo 630 emulator for any non-GDOS application, though a recently released revision seems to have cured most of the original bugs. While I did test the Diablo emulator, I was fortunate enough to have a "sneak preview" of the Epson emulator from West Germany's DMC (Design-Marketing-Communication). It seems to work at least as well as the Diablo emulator in text mode and, like the Diablo emulator, the print quality was excellent. Graphics, however, still need a little work. Though the Epson emulator handles a screen dump beautifully, it has problems with some Epson printer drivers. PrintMaster + in particular seems stuck in a "double space" mode, and Certificate Maker required at least one megabyte of buffer space to work correctly. If Atari could make this Epson emulator bug-proof and widely available, it would go long toward making the 804 a good choice as an "only printer." Without such an emulator, the 804 is limited to high-speed GDOS operations and daisy wheel emulations, a frustrating problem for those of us with large, Epson-compatible libraries of text and graphics software. At best, it'll be two years before third-party software houses get around to supporting the SLM804, assuming they ever get around to it. Unfortunately, due to an apparent lack of interest on the part of SLM804 owners, Atari (USA) has decided not to openly support the Epson emulator. They have instead chosen to encourage software houses to support the SLM804 directly, rather than settle for an emulator. I can understand and respect that decision, but I'd still like to see a workable Epson emulator. Though the initial price of the SLM804 is fairly reasonable, it has the highest cost-per-page rating of the lasers tested here. Due to the high cost of replacement toner kits ($60) and printer drums ($200), the SLM804 costs almost 4¢ per page to operate. If you include the cost of upgrading your current ST to two megabytes of RAM or the cost of buying a Mega to drive it, you'll find the SLM804 quickly becomes the most expensive printer tested. We need to keep something in mind, however: Even with the cost of a Mega thrown in, the total system cost is still well below what Apple wants for its laser alone. Though fast, the SLM804 doesn't give you the same feeling of solidness and reliability that the LaserJet and BlaserStar do. Part of this impression is from the fact that the SLM804 isn't as quiet during printing as the others, though the overall noise level is still low. Also the boxy, plastic case lacks the sleek, compact look of the H-P and BlaserStar and doesn't give the same feeling of solidness. So while the SLM804 appears to be well-built, only time will tell if it will match its big brothers in the durability sweepstakes. 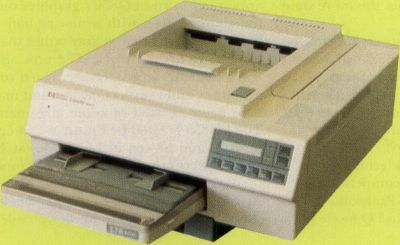 The SLM804's font capacity is limited only by the amount of RAM in the host computer and, theoretically, anyway, should be capable of emulating any printer or print language currently on the market. As proof of this, Atari recently announced support for the UltraScript print language from Imagen that emulates (and I hear improves on) the rather overpriced PostScript system. Atari's support of this PostScript clone indicates that they want to move the system upscale, with an eye on the Mac/PC-based desktop publishing market and not just the home user. Rated at eight pages per minute, the SLM804 is the only printer tested capable of doing even a quarter of that speed on single-page printouts. This unit offers the highest overall print speed in its class, with GDOS flexibility. In contrast, it also offers the highest cost-per-page of the lasers tested and limits you to an expanded ST or Mega to drive it. The Atari SLM804 retails for $2,000. NOTE: Times and Quality ratings on the Laser & InkJet printers will be followed by a letter indicating what emulation mode or driver the unit using during that test. @: Software tested has no driver for this printer or the emulator wasn't compatible. *: Software forces the printer into an 8-Pin Epson FX mode with poor graphics quality. 1) WordWrilcrST& 1ST Word are based on a 4 page ASCII text file. 2) Degas Elite and PrintMastcr+ tests arc based on a single page graphic. 3) PubPartner, Easy Draw, &WordUp tests are based on a 4 page text & graphics file with 1 graphic per page. 4) All tests were performed using an Atari Mcga4 and Mcgafilc20 HardDisk to minimize disk access times. 5) The DeskJet & Lasers were set to 300X300 DPI output, the LQ850 produced 180X180 DPI and the Panasonic produces 120X144 DPI. All times taken from pressing the final ‘print’ key (or screen dump) to the finish of the last page. This includes any ‘set up’ or load time required by the program, but NOT the changing to a special ‘outprint’ program or a forced ‘disk save’ such as that used by 1ST Word or Easy Draw. *: Dot matrix and ink jet printers are capable of both draft and letter quality modes. All listed numbers in blocks with an indicate Letter Quality numbers. For draft text simply halve the listed costs per page. Note: Laser printers normally lack a ‘draft’ mode, the DeskJet is unique in offering both Draft and 300dpi LQ text. An exception are the new printer drivers from Neocept (WordUp), these now offer the choice of draft (1/2 normal) or final print quality on ALL their drivers except for the SLM804. Though HP lists life expectancy for its ink cartridge at 332 LQ pages (double spaced), Gary Jensen of Dataquest found the unit capable of producing up to 400 such pages in his Research Newsletter for Dataquest. My cost analysis differs from Dataquests' so I've used only my cost figures on ALL tested printers. Terms Used in this Chart. Std/Exp: The RAM that comes built into the printer fit the Maximum RAM it can be expanded to. Engine Life: The factory's estimated life span for the print engine (basic mechanics of the printer itself) in double-spaced pages of LQ text. Numbers are based on manufacturer's owner's manuals or conversations with their representitives. NOTE: the engine life of the Panasonic 1092i is an estimate only (no help from owner's manual or Panasonic) and is most likely low. Ribbon/Toner/Drum Life: The number of double-spaced letter quality pages produced by a new ribbon, toner/toner refill or laser drum, again based on owner's manuals. Fonts: the # is the number of fonts built-into the printer, C shows it will accept a font Cartridge and S indicates it will accept Software ‘downloaded’ fonts. Only basic fonts such as Courier & Elite are counted, printers usually include various styles such as italics and bold as 'fonts' as well with lasers adding portrate & landscape as different fonts. 1 counted only basic fonts to simplify the chart. The SLM804 keeps its fonts in the computer's RAM. Price/Page-consumables: cost per LQ text page in Toner & Drum, ink, or Ribbon costs. Based on: cost of consumables divided by the # of pages of LQ text produced by that consumable. Price/Page-lifetime: cost per page of LQ text for the life of the printer, includes cost of printer & ribbons or toner/drum for the claimed life of the unit. Based on: ((cost of consumables divided by the number of pages produced) * the total engine life of the unit) + the retail cost of the unit divided by the engine life of the unit. LQ PPM: pages per minute of LQ text print in the Letter Quality Mode, as claimed by manufacture. Graphics print speed will be much slower. This is based on copies of text ALREADY IN THE PRINTER'S RAM! Emulations: the different printer commands the unit will respond to. Epson: Epson 9-pin, 630: Diablo 630 daisy wheel, HP: Hewlet Packard LaserJet. Duty Cycle: claimed # of copies per month the unit was designed to produce. All prices and costs are based on MRSP!!! Discounts are available on most printers and consumable items. NOTE: As the cost of printing paper is fairly constant, it was NOT included in the 'cost per page' figures. The last of our tested systems is the new DeskJet from Hewlett-Packard. This bubble-jet printer is a sample of the newest inkjet technology, and it shows on every page. 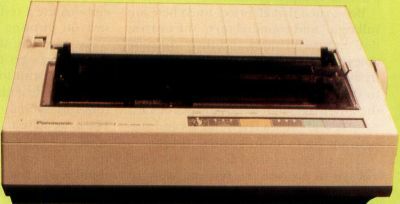 The DeskJet is an unusual hybrid that combines the advantages (and disadvantages) of both dot-matrix printers and lasers. It offers high-speed draft and LQ modes with a text and graphics print quality that rivals the best lasers on the market today. It also easily matches the speed of most 24-pin printers in text mode and generally exceeds them in quality (300 dpi vs. 180 dpi). Unfortunately, graphics are quite a bit slower, with up to 30 minutes or more needed for a 300-dpi GDOS page (depending on the GDOS driver). The DeskJet is as quiet as a laser (it barely hums during printing), fast and simple to feed, with ink cartridges and cut-sheet paper installation designed for even the most ham-handed of us. But there is a fly in the soup. This fly is that the DeskJet is expensive to operate. Though the unit is reasonably priced (under $1,000), it is far from cost effective on a page-per-page basis. This is due to the cost (and 400-page life, based on DataQuest's tests) of the DeskJet's ink cartridges. In addition, the unit is not designed for heavy-duty use. Though fine for most home applications, the rated 50 pages per day output of the DeskJet will restrict it from many businesses. Keep in mind that this is an estimate only and, like most duty cycles, is conservative. The DeskJet comes with one font (Draft & LQ) built-in and offers optional Epson emulation ($75), so it should prove reasonably compatible with most ST software. Though it works best with its own custom drivers, the DeskJet will respond to most LaserJet commands, enabling you to start printing right away if you have access to LaserJet drivers (including GDOS drivers). So the DeskJet offers a set of mixed blessings. It matches most 24-pin dot-matrix printers in speed, offers text and graphics quality to match most lasers, and is priced well below any laser on the market today. In return, you're somewhat limited in the type and size of paper you can use (no labels allowed), and are stuck with higher printing costs, a comparatively short life span, water-soluble ink and having to buy a $75 Epson cartridge that is a must for Atari owners (but at least it's available and it works). Did you know that copier paper has a right and a wrong side? It does, and it makes a noticeable difference on the DeskJet. Also, while the DeskJet has an optional 128K RAM upgrade board available, it is for downloaded soft fonts only. Adding this board will not affect your print speed or the internal buffer size. In short, it's up to you to balance the DeskJet's advantages and disadvantages. If you're not planning on doing the printing for a major company or office and want perfect print quality, then this is a printer that must be considered. But if your print needs are heavy and you prefer long-term cost efficiency over short-term savings, then this unit may not be your cup of tea. 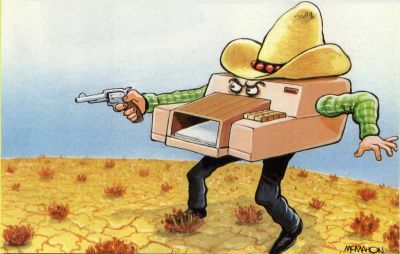 Keep in mind though, even with the higher cost per page, the difference in price between the DeskJet and a laser will buy a lot of ink cartridges. Something else to remember is that both the DeskJet and the LaserJet come from Hewlett-Packard, an outfit with a proven track record of support and service that most companies only dream about. The Hewlett-Packard DeskJet retails for $995. A newcomer to the printer market is Blaser Industries' new BlaserStar II. So there you have them: six of the best printers currently available for the Atari ST system. Recommendations? Well, if you're on a really tight budget and your needs don't include high resolution graphics, the Panasonic 1092i may well be your best buy. Its text quality is good and it handles graphics surprisingly well. In addition, the initial cost of the unit is low and, providing you reink the ribbons, its printing costs are low as well. If you want higher quality print but still want to spend under $1,000, your choice is between the LQ850 or the DeskJet. (I wanted to test an NEC P6 as well, but it just didn't work out.) 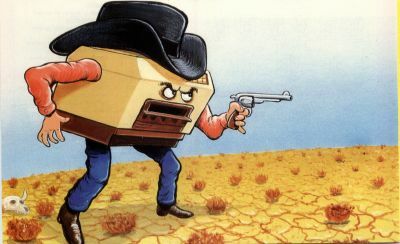 Though the text quality of the Epson is very good, I have to give the nod to the DeskJet. Despite the higher operating costs and probable shorter life span, the quality of the DeskJet's print is too high to ignore. Assuming you don't mind spending a little more for ink cartridges and take proper care of it, the DeskJet will more than satisfy even the most demanding quality needs of any text- or graphics-oriented computer owner. And the lasers? Here we have to set some priorities. If reputation and print quality are your prime demands, the HP LaserJet is the only way to go. It has an outstanding reputation in the industry and a print quality second to none. The only real drawback, other than price, is that it demands that you work within its command set. If, however, you also want cost effectiveness and enough built-in emulation to handle all your current software, you're going to like the BlaserStar II. This beast matches the LaserJet in just about every category and offers an initial price and economy of use that beats the competition hollow. But be sure to turn it on after the rest of your system, otherwise you're just wasting electricity. Finally we come to the SLM804. I'd really wanted to see this one lead the pack, but it just wasn't meant to be. Several things hurt the SLM804, with the cost per page and lack of software compatibility being the most important. 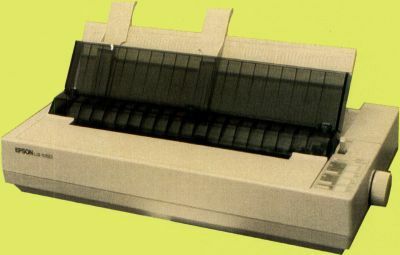 If Atari could reduce the price it wants for toner and drum replacements (or third-party sources became more common) and make a working Epson emulator readily available, it would make the SLM804 a lot more attractive. Also hurting the unit is the fact that you must have at least two megabytes of RAM in your computer to fully utilize it. This limits the potential buyers for the SLM804 to only a fraction of the current ST market, and totally ignores all other computer systems. Still, if print speed and overall print quality are your prime concerns, and you have (or are buying) a Mega system, this is definitely the printer for you. That's it folks. It's up to you to set your priorities and make your selections. After all, you're the only one who really knows just what you need out of your printer and what you can afford to spend. "But," you say, "you didn't tell us which printer you decided was best, the one you bought for yourself That's right, I didn't. And guess what? I'm not going to tell you, at least not until the next article. Don't you just love a mystery?